The Pacific Northwest is famous for both its salmon and rain, but when the two meet, it’s not always sunny. On May 16, members and guests learned about what happens when all that rain hits our cities and streets, washing thousands of pollutants into local waters and creating a toxic stormwater cocktail for coho salmon. But it’s not all bad news—we also explored ways Seattle has worked to lessen those impacts using highly effective and accessible solutions: rain gardens and other “green” infrastructure. 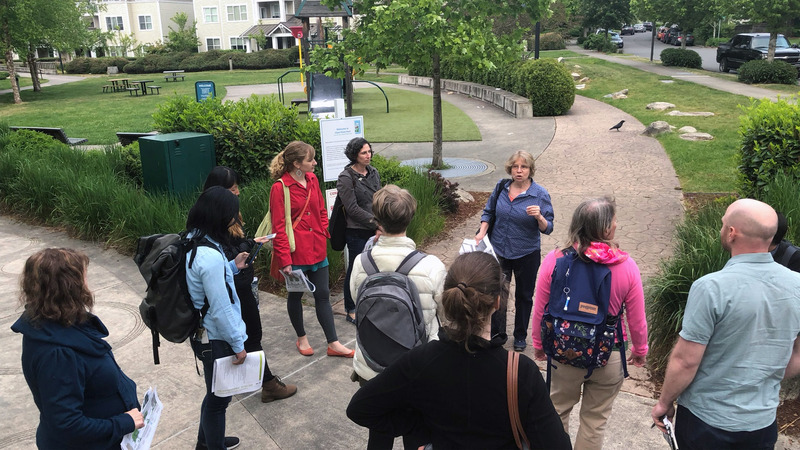 On this one hour, 10-20 block walking tour, landscape architect Peg Staeheli of MIG|SvR design told us about the award-winning, sustainable transformation of this neighborhood and watershed and her involvement in its design. Biologist and green infrastructure expert Aaron Clark of Stewardship Partners shared how those and other efforts have helped improve water quality in nearby Longfellow Creek, where in the past coho salmon would die before spawning. During the tour, NOAA research scientist Nat Scholz discussed his research on salmon and urban runoff as well as efforts to restore Longfellow Creek. After the tour, we met at The Bridge for drinks and further discussion with our tour leaders.